Description of "30 Staple Items every Man needs Part I (eBook)"
This book and it's upcoming sequel will help you elevate your style and find new opportunities in life. Classic Men's clothing has become rare lately due to lack of education and erudition. This book will help you build a classic timeless wardrobe and shed the light on cost per effective wear. Imran Jazib is a freelance writer on classic menswear and a relentless follower of the biggies in the industry like gentleman's gazette and real men real style. 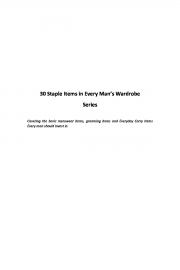 Reviews of "30 Staple Items every Man needs Part I (eBook)"